Read the rest of them at The Kirk Report. I hate "newsletters". You give someone your email address and they send you garbage. These newsletters are usually littered with advertisements with little or no information. The final days of a bull market are substantially different than the final days of a bear market. At most bear market lows, the vast majority of stocks tend to bottom in unison. At most bull market tops, the vast majority of stocks seem to top out on an individual basis. Do you know of any (free) stock market or trading newsletters that are worth subscribing to? 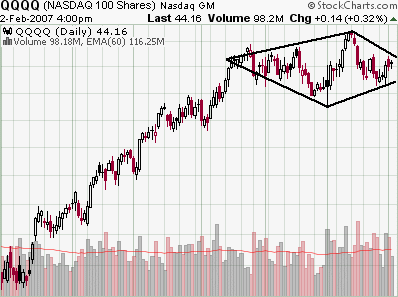 A Diamond Top Chart Pattern In The Q's? Diamonds from short-term price trends leading up to the pattern perform better than intermediate or long term trends. Select tall patterns for the best performance. Diamonds with upward volume trends do better postbreakout than do those with falling volume trends. Pristine recently sent out their newsletter. This is another newsletter that I am a big fan of. In this issue, they talk about reversal times. I remember when I first read about them. I was stunned! What the heck is a "reversal time"? The 5 major ones to watch are the 9:50-10:10, 11:15, 1:30, 2:15, and 3:00 reversal times. Not bad. Looks like it still pays to keep on eye on these time zones! I've added a couple of new trading videos today on the swing trading videos page. One is on trading first pullbacks and the other one is on getting good entries. If you have an idea for the next video, let me know! If you look at a longer time frame (1 year or more) you will see that this stock was going nowhere. Finally it broke out of a sideways pattern on nice volume. Then, the pullback happened. This stock pulled back to the 10 period a moving average. This is usually where momentum traders tend to buy stocks. They likely put their stops under that swing point low. The stock then rallied and momentum traders were very happy with their trade! But many of them did not get out of this stock. They still have their stop loss order in on at least some of their shares. Oops! Some of these traders got stopped out today and if the stock trades any lower than where it is now, there will likely be a lot more selling to come. But that is what we want to happen. We want as many traders as possible to sell their shares before we get establish a position! That will set up a nice swing trap chart pattern in a first pullback scenario. If we could get a nice reversal candle like a hammer or an engulfing pattern, it would be icing on the cake. Looks like a cup and handle pattern is forming. Nice. This is one of my favorite patterns to trade. Is this a stock pick? Nope. I don't give out stock picks. A Kicker candlestick pattern is consists of two candles. The first day is a down day and closes near the bottom of the range. The second day opens above the previous days high and close. This pattern is reversed on the short side. This move is usually the result of an unexpected news event. I like this candlestick pattern because the sudden move traps other traders on the wrong side of the trade resulting in an explosive move. This leaves them scrambling to buy or sell their shares. The sudden change in sentiment can be enough to ignite new trend. This is why many traders consider this pattern to be the most significant candlestick pattern of all. How do I Scan for This Pattern? Do you use TeleChart? The criteria for a bullish kicker can be found here. How do I Trade This Pattern? Most traders will tell you to buy the stock on the day of the second candle. I disagree with this for the most part. The only way I would buy it on this day would be to move down a time frame to the 60 minute chart and try to get a low risk entry there. This kicker pattern on Yahoo came after a significant trend line break and after a reverse head and shoulders pattern. You can see this if you look at this chart with a longer time frame. One downside to this chart is that it was trading below a declining 200 period moving average. That is usually a negative sign, but not in this case. Here, the Kicker changed the whole outlook. You can scan for these patterns directly or you can just run a normal TAZ scan and look for this pattern along with others. You can see why traders think this pattern is one of best of all candlestick patterns. It's a candlestick pattern that has the potential to ignite a new trend. Dr. Brett has another outstanding post on his blog (Does he ever have a bad post?). He talks about a chart pattern that comes courtesy of professional trader, fund manager, author, and educator Ray Barros. His basic method is to enter trends on pullbacks, relying on the structure of the setup to provide both entry and stop. This creates a nice risk:reward ratio and, in my book, merits acknowledgment as a best practice. I guess after you have looked at thousands of charts, you would eventually "discover" this pattern. Buying pullbacks is a common practice in trading. But after getting stopped out on this pattern so many times, you will eventually begin to watch for it! In this post, Ray talks about "swing charting". If you are not familiar with this, then check out this excellent article on swing charting from StockCharts.com. The basis of this type of charting is the filter. Once prices have moved by the distance specified by this filter, a new line is drawn next to the previous one. In a nutshell, it is a chart that shows up and down price movement of a minimum size regardless of the time it takes. On this chart I used zig zag with a 3 period setting to help identify the swings. I don't think it is necessary to use this on your charts but if it helps you to better identify this pattern, then by all means use it! I think it is important to understand the psychology behind this pattern. Once you understand why this pattern works, it will become one of your favorite patterns to trade. In fact, it's the first thing I look for when I run my scans! Not only does VCA Antech appear to be a good company, but it also has a great looking chart. It's carved out a nice basing pattern after finding support near the 200 day moving average. Right now it is trading right at a significant resistance area - so I wouldn't run out to buy it right now. BUT, this could turn out be a fantastic trade on a nice pullback. It will be going on my watch list. I recently wrote about the diamond chart pattern in QQQQ. Michelle B. then followed up with an outstanding article about this chart pattern on Trader Mike's blog. Now that is a good example of this chart pattern - and I didn't even need to mark up the chart! Trading Markets has a great new article out on its R2 market timing strategy. This market timing strategy uses RSI with a 2, 3, or 4 period setting on the S&P 500. It also list 6 trading rules to use with the strategy. Our research has shown that there is little statistical evidence using the standard 14-period RSI. But, when you shorten the period to a 2-, 3- or 4-period RSI, test results significantly improve. This market timing strategy is very similar to the market timing strategy that I use. They are using RSI with a 3 period setting and I am using Williams%R with a 3 period setting. Just a different technical indicator. Very similar! It looks like RSI will give you fewer trading opportunities but there aren't as many "whipsaws". Williams %R is a little more "sloppy" but there are more opportunities. Kind of a trade off there. ...and you can get it all for the low price of just $7,500.00. Where Do I Start and Stop Fibonacci Lines? I got an email the other day from a trader that asks, "Where do I start and stop Fibonacci retracement lines?" That is kind of hard to answer in a email. So, here are some charting examples. The first thing you have to do is identify all of the swing points in a trend. Ok, that was pretty easy. Stockcharts.com automatically puts in price labels at those points! They also put in all of the swing point highs. You'll notice that we did not use that one swing point low after $42.99 because there was a lower one to the right of it. You start and stop them at those points because that is the most recent swing point high and the most recent swing point low. In this chart, I started the Fib grid from the highest swing point high and the lowest swing point low on the chart. For retracements, you always use the most recent swing point high, but you can use any one of the previous swing point lows. The majority of the time I will use the most recent swing point high and the most recent swing point low. Unless, I am looking for Fibonacci clusters.